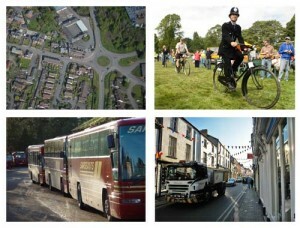 Transport: What are the issues? We need your views on these policy issues and on possible sites. Please leave your comments at the bottom of this page. Great web site – well done Richie! Can’t make the meeting on July 30th but urge some serious consideration of traffic calming/pedestrianisation of High St. It may seem impossible to conceive/implement but if accompanied by revised (free!) and additional parking it could transform the town whilst not deterring the traffic that is necessary for the economy of the town centre. Hergest Road would benefit from some calming too. I fear for the school kids who walk it with traffic at well over 30mph. A solar powered speed indicator down by Hergest Mill – like the one at the entrance to Eardisley – would help. I would use a minibus service to between Hay and Kington via Brilley and many others would too? Establish 20mph zone as much as is feasible within the by-pass and make shared use within the streets of a mainly commercial character. My suggestion is to make the length of the High Street one way. The single carriageway to current regs. would be lower as now for safety reasons, but rising gently to pavement level at, say, a couple of (delivery) points along its length. The pavement on the north side would be slightly increased in width with most of the increase on the south side, between the delivery bays. Duke Street could also be one way as a continuation of the High Street up to the Oxford. It is narrower at this point and pavement widths could again be increased, the wider one being on the north side in this case. Making the High Street and east end of Duke Street one way. If one way running east to west, traffic coming up Bridge Street, including buses, would turn left only onto High Street. To collect and drop bus passengers from Duke Street and Bridge Street they would use bypass. Cars etc wanting to use the carparks at east end of High Street would generally use Dukes Street or Bridge Street as now, although entry to Market Hall Street carpark would be from Bridge Street only. The problems in the High Street seem to me to be serious and requiring urgent action. Old photos suggest that they are not new but I imagine that vehicles travel much faster than they did 70 years ago. It hardly needs saying that Kington makes great claim to be a centre for walking. There are also a large number of elderly people living here, as well as parents with young children, cyclists, dog walkers etc. The pavements are narrow and dangerous with the amount of traffic and size of vehicles using the High Street in particular. Improvements are obviously urgently needed but I don’t see how the Shared Space option would work given the street width we have and present usage,and without pavements being defined by a level difference as now it would seem to me to be more dangerous. My suggestion, which has no doubt been looked at before, is for the High Street to be made one way. A single carriageway to current regulations would give us wider pavements, on the north side widened a little, on the south side more substantially. I think the carriageway should be lower for safety reasons but with ramped lengths to slow the traffic down,also providing two or three delivery areas for the street within the wider pavement zone. I envisage this arrangement continuing at the west end of Duke Street up to the Oxford, the narrowest part. Here the wider pavement of the two would be along the north side. Beyond this Duke Street would remain two way. The one way system if running from east to west might reflect the fact that most traffic enters Kington from the east and south. Buses picking up passengers in Duke Street and Bridge Street would use the ring road access to Duke Street. Other vehicles accessing the eastern carparks would enter and leave as now via Duke Street or Bridge Street. Vehicles leaving the west carparks would enter as now but need to leave via Church Road if journeying out of town. If one way from west to east the traffic arrangement would remain as now for eastern carparks. Western carparks would be accessed from the ring road via Church Road to the north only, but would be able to leave in north, east and southerly directions as now.